Lunar New Year celebration is another chance to enjoy bright colors, festive food and Asian party decor with friends and family. Also Chinese New Year is another opportunity to change life, inviting more exciting events, positive changes, wealth and happiness into your home. Chinese New Year celebration is about making wishes, sharing great food and fun of making paper crafts, exotic Asian decorations and creating festive atmosphere for the entire year. Chinese New Year celebrations are a perfect time to Feng Shui home for wealth and create relaxing and balanced environment that supports your dreams and attracts good luck. 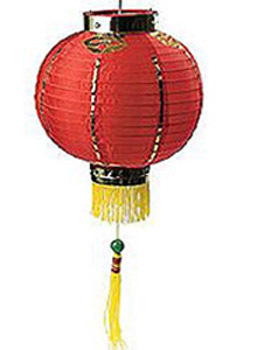 The positive energy of lunar New Year celebration, created by people around the globe, is a great support for all who wants to learn about Asian cultures and bring more magic into life, inspired by the mysterious Moon and glowing paper lanterns. According to Chinese calendar 2012 is 4710 lunar year, and Chinese New Year is a great time to think of simple life pleasures and decorating a home in Asian style, making paper crafts and enjoying an exotic holiday party decor with friends and family. According to Chinese calendar, 2012 is the year of an amazing creature, the Black Water Dragon. Let all fantastic dreams come true in 2012, starting a chain of surprising pleasant events in your life on January, 23. 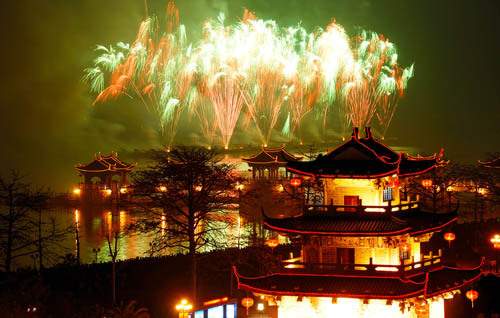 New Year celebrations, associated with Western winter holiday, New Years Eve and Asian spring festival, are wonderful events. Warm and magical, New Year celebrations make all people, adults and kids, waiting for miracles, happier. Optimism, jokes and smiles are a great reason to meet with friends again and celebrate another holiday in winter, the lunar New Year, adding more fun, spring mood and joy to our busy life, which is often lacking fun and positive emotions. A depressed state of mind, economical problems and irritability make life sad. 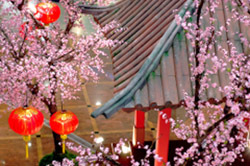 Chinese New Year celebration is a nice holiday that helps improve mood in winter, bringing spring freshness, Asian food, unique holiday decorations and spectacular paper lanterns into modern homes. Happy lunar New Year and may all your wishes come true, attracting health, wealth and good luck to your home and family.